Have the kids been nagging you for a dog for years, or perhaps you have found the perfect rescue pup? Whatever the situation, after all your research on what breed is the right fit, you are finally close to bringing puppy home. Here’s some tips for preparing for a new puppy. But what can we do to prepare ourselves for the big day? The following information might just help everything go to plan. To start off with, there are some basic accessories and other equipment you will need to purchase when preparing for a new puppy. Do your research or ask your local pet store for advice on the right size for your breed. Dog play pens are usually foldable and come in different sizes depending on the Breed of Dog. These can be really useful if you or the puppy need some time out! Pens can also be used in the very early stages if you need to leave home for a short time. 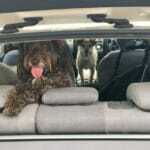 Pet travel crates are used to transport your dog in the car. Certainly good from a safety point of view and it may help the puppy to feel more confident on those early car journeys. They come in all shapes and sizes and your local pet store will have information to help you make the right decision when preparing for a new puppy. Dog crates are great for helping with puppy training and for providing your puppy with a safe ‘den’ all of its own when things get a bit much. Check out the Pooches at Play TV segment on crate training to find out about the benefits of crate training your puppy and get some advice from your local pet store on the correct size of crate you will need. Bear in mind, with both types of crates the size you need initially may change with larger dogs as they grow. Some come with dividers that you can use to keep them snug whilst they are small and remove when they start to get too big. Planning the day of pick up is really important so that you can get things off to a good start. Everything your puppy experiences in the first 16 weeks of its life will be etched in its memory for life – good or bad and can impact on their behaviour and reactions to the world around it as an adult, so you want to make sure this experience is as calm and stress free for your puppy as possible. Hopefully you have already spoken to the breeder or carer to place a blanket or item of clothing in with its mother and siblings so that you can take this home with you on the day and place it in the puppy’s bed or crate. If not, take one with you so that there may still be a chance to have the scent of its mother taken home with you. Many puppy pick-ups involve a drive of some distance and this where preparation is the key. Plan your journey well ahead of the day. From experience, a few hours in the car with kids can feel like a lifetime, especially if you put a puppy in the mix! It’s therefore important to discuss whether children need to make the trip or not. If they do go it’s vital that they contain their levels of excitement so as not to stress out the new puppy. It’s a good idea to pack the following items to help be well prepared for the journey. Correct size collar and lead (especially as you will need to stop for frequent toilet breaks on the journey home to help avoid accidents and also help your dog get used to car travel). There is always the chance that a puppy may get car sick that is why it is wise to have a “clean up kit” and also stop for those regular breaks. It’s often a good idea that the puppy has an empty tummy before a big car ride and it is worth discussing this with the breeder or carer before you collect them. Once you’ve arrived also make sure you give yourself time to go through all of the relevant documentation, health information and any tips they can give you. When you make your toilet break pit stops it is vital that you do so safely. Your pup is unlikely to have been on a lead and collar before so pick a quiet spot to stop at – this is not a time for the side of the freeway! When you get your puppy home, give it time to sniff around and check out its new surroundings with out the children vying to take turns to give it a cuddle. Ensure it has a quiet and calm experience when entering the home and make sure children agree to give it the space it needs to settle in slowly over the days ahead. Bringing home a new puppy is a very special time for the whole family, but it needs to be done with care as the puppy gets used to being away from it’s mother and siblings. If you already have another dog, introduce them slowly – let them sniff and meet each other slowly, and let them play. Don’t leave them alone unsupervised this early on and remove all items your first dog may be protective of such as toys or food as your dog might react aggressively or protectively to the new dog, even if they have never shown this behaviour before. Remember you are a resource as well, the most important one, so you’ll need to be wary of spreading the love evenly and immediately address any jealous outbursts by your current dog. Your puppy is also going to have to be toiled trained, which does not happen overnight so you can expect your puppy to have a few accidents around the home, so have patience and ensure you do not yell or punish them when this happens. When you catch them in the act, calmly pick them up and place them outside in the spot you would like to train them to go. Here’s some tips for toilet training. And most of all, ensure you home is puppy proofed before the big day! Check out our tips for puppy proofing your home. The benefits of getting Pet Insurance as early as possible. Find our more. Puppy Schools and Dog Trainers – it is vital to socialise your puppy as soon as possible! What diet to feed you dog (It’s important not to suddenly change your dogs food as it can leave them feeling sick, so check with the breeder/carer as to what they have been eating and make a gradual change any new diet). Billy Cheron is a dog trainer based in Melbourne’s Bayside area. NextGetting a puppy for Christmas?